Some people are just so creative... Victoria Brewer of England captures autumn color at its finest with these graceful quilled leaves. 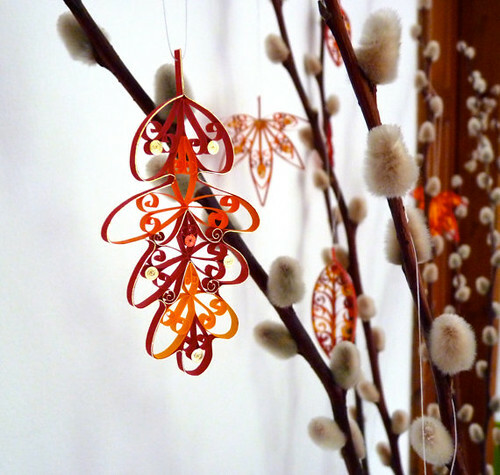 She works with orange, yellow, and gilded red paper and damar, an adhesive plant resin from the meranti tree, to create oak, sweet chestnut, and Japanese maple leaves. I can picture them sparkling and swaying in the breeze as one passes by. See more of Victoria's quillwork at VB Pure Designs on Etsy. Speaking of quilling, The New York Times Style Magazine featured a densely quilled version of its iconic T logo in last Sunday's edition. A collaborative effort led by Sherry Rodehaver of the North American Quilling Guild, the design features a variety of colorful flowers and a lifelike butterfly created by Sherry and four members of the organization. What a beautiful way to introduce quilling to a wide audience. See a close up photo of Second Nature on the T Magazine website. It's nearly the weekend... have a good one! I just can't tell you how much I appreciate your blog! Not only have you introduced me to quilling (well, I knew about it but never thought I could DO it, and now I DO!) and opened my eyes to all the incredible forms of paper art. I look forward to visiting you each day! THANK YOU!!!! Kai, that's so nice to hear! I'm delighted you've been inspired to quill by visiting here and are enjoying it. I love Victoria's designs. I marvel at her elegant even scrolls which she uses in all her quilled creations. Absolutely stunning. Love the autumnal colours. The leaves are so beautiful! Thanks for sharing and have a great weekend, Ann! I have an obsession with leaves, leaves of any kind and when I saw Victoria's delicate and beautiful creations it took my breath away. Thanks for sharing! These autumn quilled leaves are amazing. No wonder her work is in so many prestigious places. Thanks for sharing these wonderful and inventive creations! Such charming and almost exotic-looking quilled autumn leaves! Quando aderi ao seu blog, não pensei que fosse tão interessante. Adoro sempre que recebo as suas ideias, que são sempre espetaculares e muito originais. Vejo que sabe muito bem escolher as peças de artes e os bons artistas. Um muito obrigada por me ter na lista dos seus e-mail. You're welcome, Dorila. I'm glad you enjoy the posts.